Come on in and sit a spell. and let's enjoy October shall we. the topic we have chosen for the month. Sometimes we just need a little don't we? next post or you can click on another one if you missed one etc. then you will of course see the new post come up automatically. prompted by the LORD to pick up The Noticer by Andy Andrews again. It is one of my favorite books. but it also reminds me to dream. perspective, then dreaming is a little easier. Proper perspective brings clearer vision. then the dreaming is harder. completely changes my outlook of the situation. can completely change the way you go through it. It matters what we think. It matters how we deal with things. manner we were intended to. With God's help and Grace. Praise Jesus Name!!! He is our help!! 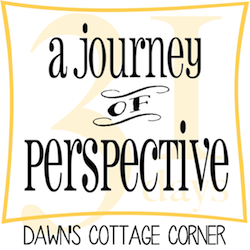 So will you join me for a little perspective this month? This is going to be great. I've fallen in love with the word perspective over the past few months. Glad to meet you through 31 days.